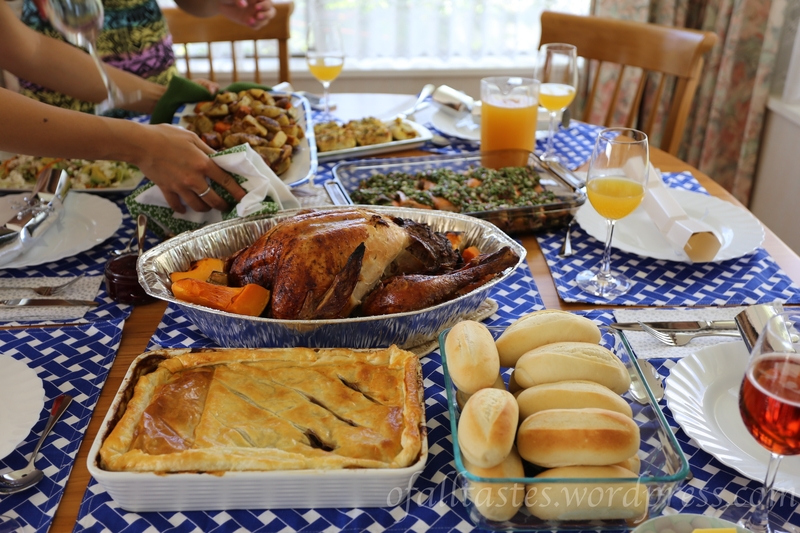 Roast turkey, meat pie, oven-baked salmon, bread rolls, salad, chocolate cake, tiramisu. That was my lunch this weekend gone by and the start of some serious (over)eating. My friends and I decided to do a shared lunch and Secret Santa. I was tasked with a main and dessert, both of which turned out pretty well. For the main, I made Guinness steak and mushroom pie and for dessert, tiramisu. I’ve come to realise that pie takes a heck of a long time to make – much longer than it would take you to drive down to the local pub and order one there, and it would taste about the same too. However, I’m glad I made the effort this time because it turned out delicious. It’s based on a Jamie Oliver recipe for a boozy Guinness steak and cheese pie but I did my own thing with it by adding shiitake mushrooms. About 10 dried shiitake mushrooms, soaked in water overnight and cut into thin strips. Keep the water that the mushrooms have been in to top up the stew. Preheat oven to 190ºC. Heat olive oil over low heat in saucepan and gently fry the onions for about 10 minutes. Don’t let them color too much. Turn the heat up and add carrots and garlic. Mix it together before adding mushrooms. Stir together and add beef, garlic, herbs, salt and pepper. Fry for 3-4 minutes and then add Guinness and stock. Stir in the flour and then top with the water saved from soaking the mushrooms. Bring to a simmer and then pour into an ovenproof dish. Cover with tin foil and place in oven for about 90 minutes. After 90 mins or so, remove from oven and stir. At this point I added more salt and pepper to taste because it tasted quite bland – it may pay to do the same but always check first! Place back in the oven for another hour or so the beef is tender and stew is thick. For the pastry lid I took out a sheet of pastry, laid it over the top of the stew, folded the sides down to make a bit of a crust, sliced the top with a sharp knife, brushed it with the egg and popped it back in the oven for about half an hour. When I was looking for a tiramisu recipe, I quickly came to the realisation that most recipes for the fluffy Italian dessert use raw egg. Considering I didn’t want to unwittingly give my friends food poisoning, I looked semi-hard for a recipe that doesn’t use raw egg. I trawled through some Google results and found one using cooked egg yolks. You can find the recipe here: http://www.askchefdennis.com/2011/04/the-best-tiramisu-you-will-ever-make/ and trust me, you will love it. I had heaps leftover after lunch and I found the tiramisu actually tastes even better once it’s been in the fridge for a day. Not sure whether that’s because I wasn’t so stuffed when I ate it a day later or if it’s actually legitimately better. I’ve been tasked with making Christmas lunch on the actual day again this year. So far, I have a crayfish. More ideas? It’s been a while since I’ve had good-tasting tiramisu but last night I finally had tiramisu, made by Andrew’s mum, that had the right balance between the sweetness of the sugar, bitterness of the coffee and sharpness of the brandy. This version of tiramisu tasted so good and I’m definitely for using real alcohol, whether that’s the traditional Marsala wine or a substitute of rum, port, brandy or whatever other alcohol can be substituted in.